Southern Illinois University Edwardsville’s Danielle Lee, PhD, a visiting assistant professor in the College of Arts and Sciences’ (CAS) Department of Biological Sciences, has been tabbed among 14 “world-changers” by the National Geographic Society. She has been named to its 2017 class of Emerging Explorers comprised of “uniquely gifted and inspiring scientists, conservationists, storytellers and innovators who are changing the world.” As an emerging explorer, Lee will receive $10,000 for her research. “I was in complete shock upon hearing of this incredible acknowledgement,” said Lee. “This means the opportunity to talk about my research on a grander scale. It boosts the credibility of my science activism and offers an international platform to demonstrate the importance of natural history in the sciences. Lee is a mammologist, who studies animal behavior. National Geographic’s designation supports her research on the “behavior and biology of wild rodents, such as landmine sniffing African Giant Pouched Rats, to better understand how we can use them to save lives.” She has conducted this research in Tanzania. Along with this ongoing research focus, she is uniquely interested in the study of rodents’ behavior and ecology across urban gradients. She will use SIUE’s expansive landscape to conduct field research focused on field mice. She is a strong proponent of the teacher-scholar model. This summer, an SIUE graduate student and undergraduates will have the opportunity to volunteer to assist in her field research on campus. 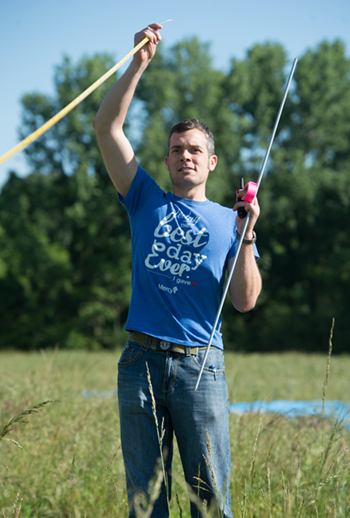 By summer’s end, Lee hopes to begin conducting pilot behavior tests on-site. This will involve capturing the animals, keeping them for about an hour to do testing and then releasing them again. The researcher emphasizes that she is ministering to her former self, the young girl who was curious about animals and science. She aspires to foster that passion in others and help them find their “on ramp” into the sciences. Lee plans to use her $10,000 award from the National Geographic Society to travel back to Tanzania next summer to continue her research on the African Giant Pouched Rats. Along with forwarding her work, she plans to scout opportunities for SIUE students to travel with her in the future. Photo: Danielle Lee, PhD, visiting assistant professor in the SIUE College of Arts and Sciences’ (CAS) Department of Biological Sciences, conducts field research. Dr. Lee and Dorsey native Shawn Stumph, a senior majoring in biological sciences, set up research plots on campus. 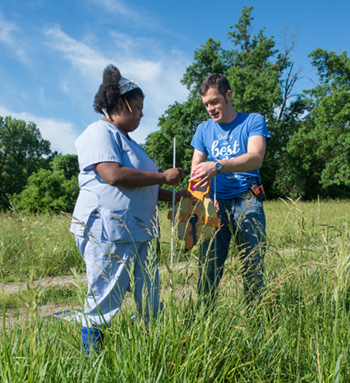 SIUE undergraduate Shawn Stumph helps Dr. Lee measure and mark research plots.